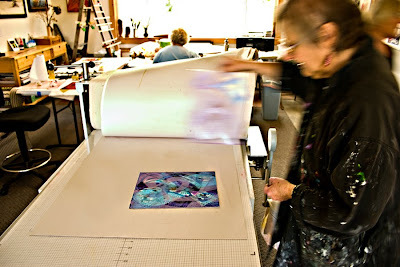 When print and water color artist Ilse Reimntiz invited me to co-instruct a monotype workshop I happily excepted. Ilse is an incredible artist and mentor to many, myself included. Her print imagery ignited my initial interest in monotype, for which I am truly grateful. September 10-12 we coached five enthusiastic, print curious, artists in basic monotype techniques and were witness to inspiring results. Check out the photo below of one students dynamic work in progress. What fun! I am already looking forward to the next workshop Ilse and I will conduct early in the new year.